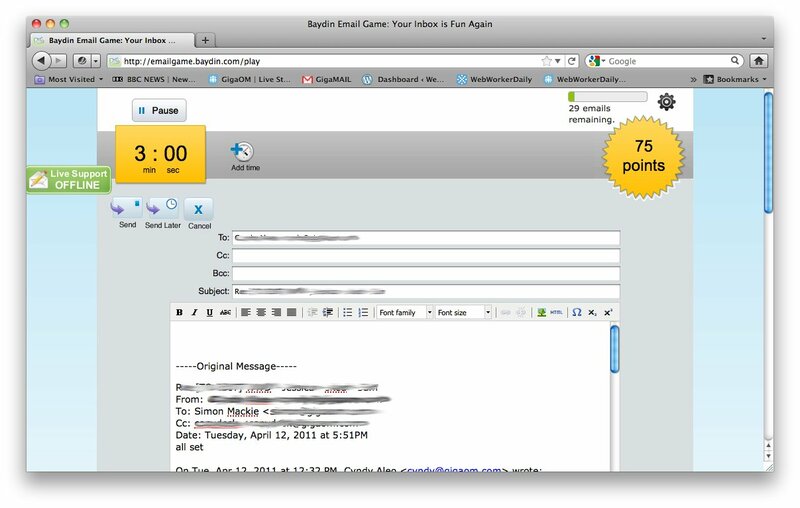 After authorizing the app with your Gmail or Google Apps (s goog) account, you’re presented with the top email in your inbox and have 90 seconds to decide what to do with it: Archive, reply, label or “boomerang” (which archives the email, but will bring it back into your email automatically at an allotted time). 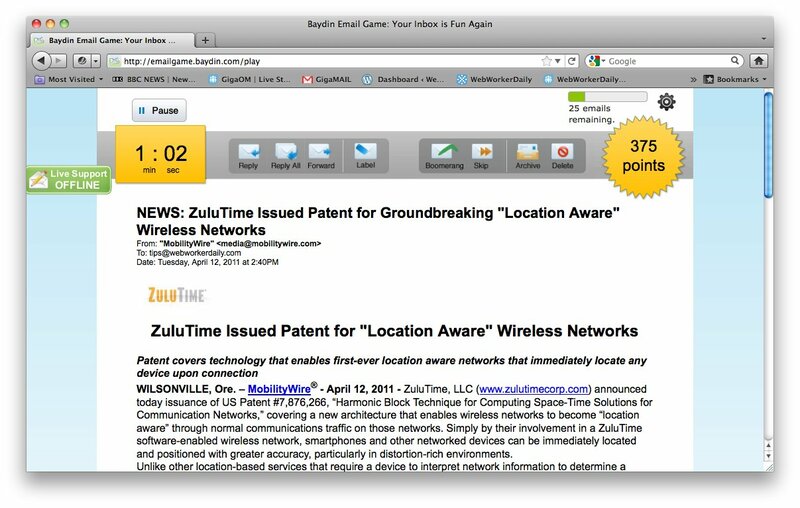 Each positive action taken adds points to your score and moves you to the next email. Take more than the allotted 90 seconds, or “skip” the email without deciding to take action on it, and you’ll lose points. If you decide to reply to a message, you’re given three minutes to compose your reply. Again, if you delay, you’ll lose points, although you can always click the “add time” button if you have to compose a particularly long email. Note: By default, The Email Game adds a link to itself in your email signature, which I found a bit annoying; you can remove it in the app’s settings page. The “gamification of work” is something that’s attracting the attention of a few companies recently. Rypple, for example, is using gaming mechanics to increase engagement with its employee feedback app. While it remains to be seen as to whether gaming mechanics really can improve worker engagement and productivity, as Jessica noted in a recent post, game enthusiasts do tend to display the kind of traits — being bottom-line oriented, tolerant of diversity, comfortable with constant change, happy to learn, and intensely interested in innovation — that should also be advantageous in the workplace. The free version of The Email Game works only with Gmail and Google Apps accounts. An enterprise edition is available that works with Outlook/Exchange (s msft) or IMAP accounts and costs a rather pricey $20/seat/month.